It’s a Sunday afternoon, the remains of breakfast plates scattered on the table and Marr rumbling in the background on the television. Eggs were scrambled with far too much butter and salty smoked bacon grilled to a crisp. My avocado was a little disappointing, a murky pond water green but I drowned it in lime juice anyway. We lean back, eyes towards the television making vague plans for the day. I remembered the bananas on the counter I’d purchased earlier in the week, urging their skins to blacken for baking and announce I would make a banana loaf. When I bought the bananas, we both agreed that we had a distinct dislike for the texture and taste, yet could tolerate them in doorstop slices of a sweet loaf. The kitchen became mine and I baked in silence, tweaking and adding and scribbling down notes. The rain was coming down fast on Sunday, but the flat felt like it was warm with that loaf tin in the oven – the scent of sugar and banana and lemon filling the room. It’s a happy place I’m in, a place where baking no longer feels like work after a busy couple of months spent on other projects, meaning my oven only met the same creations time and time again. 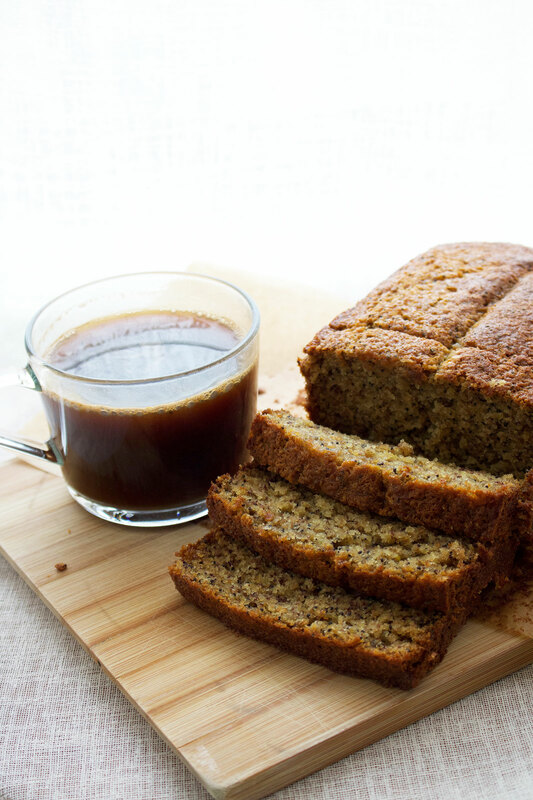 To make time for a banana loaf felt indulgent. I sliced into it while it was still warm, each piece collapsing a little thanks to my impatience but I didn’t care. 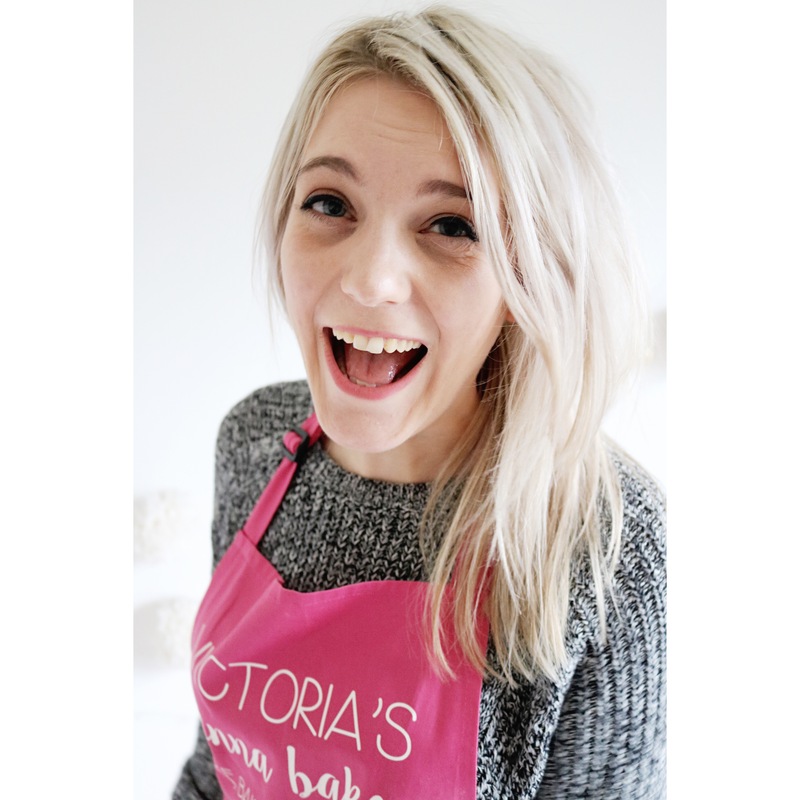 I ate hungrily, wrote the recipe from my baking shorthand and decided to share it on the blog. It’s a simple bake, the kind most of us enjoy, where one bowl is used and little washing up is required. I made this loaf a little more wholesome and with some bite thanks to wholemeal self raising flour and a good helping of poppy seeds. A little lift from the lemon brings a little sunshine, but the happiest thing is that it looks so good for you that it could be easily eaten for breakfast. I’d add this loaf gets better with age but I wouldn’t really know – it seems to have disappeared so quickly from the kitchen counter after just a couple of days. Preheat the oven to 180oc/160oc fan and grease and line a 2 lb loaf tin. In a large bowl, mash the peeled banana to a soft puree, then add the rest of the ingredients aside from the lemon and poppy seeds. Using a handheld mixer, beat the loaf mix until thick and smooth. Add the lemon zest, lemon juice and poppy seeds and stir to combine. Pour the batter into the prepared loaf tin and bake in the oven for 50 to 55 minutes until a skewer inserted in the middle comes out clean. Place the loaf on a cooling rack for 10 minutes then squeeze a little lemon juice over the top to let it sink into the crust. Carefully remove from the tin and cool completely. 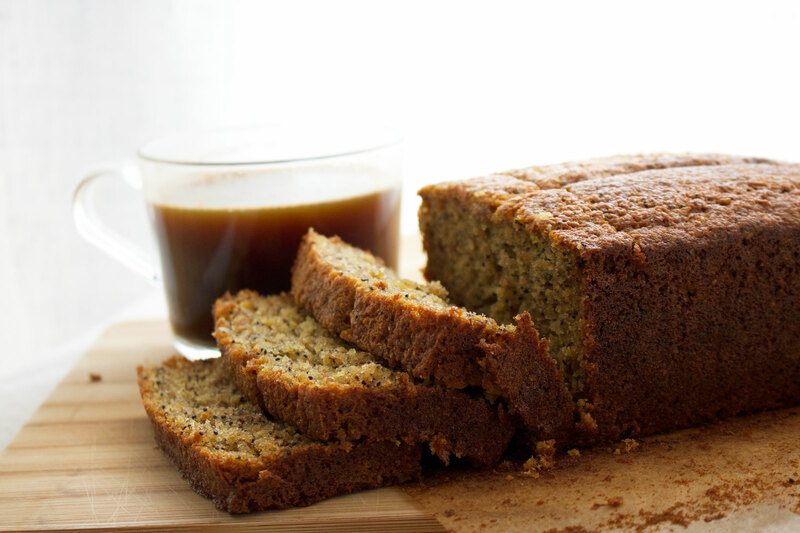 Slice and serve with coffee, keeping the loaf in an airtight container for up to three days. oh my goodness that sounds so so so so so so so so good! 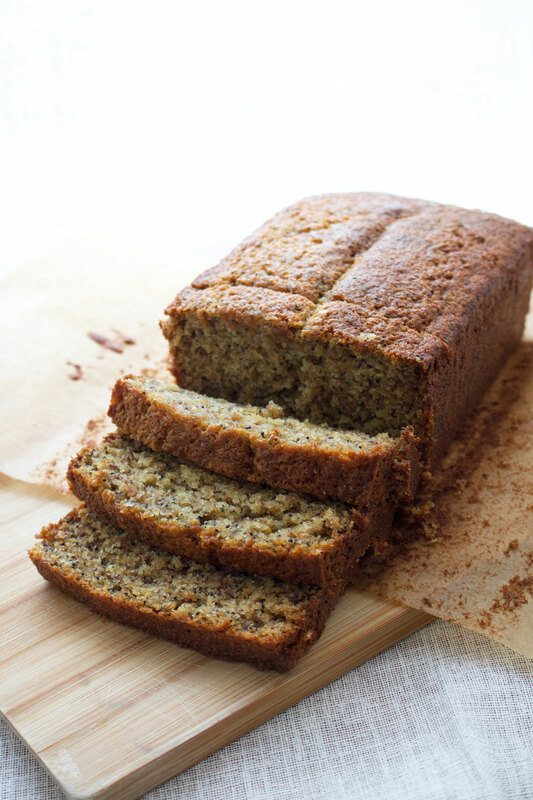 I love banana loaf, so yummy! I’m a total convert, been buying bananas now to make a loaf weekly! Looks delicious 🙂 bookmarked to try!! Thanks Amanda, hope you like it as much as I do! I love lemon poppyseed bread so much, adding banana to it is genius! Can’t wait to try it! Thanks Leigh, it’s one of my favourite flavour combinations! Thanks Trina, I’m in love with banana bread right now! I love banana bread! This is a delightful recipe!